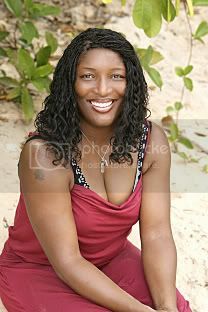 Tamara "Taj" Johnson-George already has a lot on her plate, but can't wait to add SURVIVOR contestant into the mix. A Grammy®-nominated singer, successful author, wife of a former NFL pro and mother of two wonderful boys, Taj believes she will be the "most underestimated player" in the game. A Grammy®-nominee for her soul group SWV ("Sisters With Voices"), Taj says "her group was the one to beat." Selling over six million records, her time as a singer has prepared her for the spotlight. In addition to her music career, Taj is also an accomplished writer. The author of “Player HateHER: How To Avoid The Beat Down And Live In A Drama Free World," she tries to practice what she preaches as her true pride and life’s focus lies within her family. The wife of Heisman Trophy winner and former Tennessee Titan running back Eddie George, she warns all opponents, "I'm not the average NFL wife and mother." Growing up in Brooklyn, Taj overcame both physical and mental abuse in her life. With her background, it's no wonder she says she's "naturally distrustful." Taj goes on to say "I am literally, truly a survivor, who has survived more things you can ever imagine." She is used to beating the odds and plans to do it again. In her free time, Taj says she is very physical and likes to workout, running, swimming and doing yoga and kickboxing. Taj is the total package built around strength and street smarts and will be a fierce competitor in this game. Taj currently resides in Nashville, Tenn. Her birth date is April 29. I kinda like her, but don't think she can win this. It is kind've funny how much the other contestants were surprised who her spouse was. Please tell me i'm not the only one who's impressed with this woman. Taj is one of my favorites too. Now will she win...I doubt it. Hopefully her strength in the tribe will keep her close to the end. I think she might do a Cirie and become a season favourite this season. I just hope she, Brandon and two others (Sierra, JT?) will KICKASS and eliminate everyone else and make the final 4.
ty for the vid's will... there awsome..